Early last year, Brother Nebula commenced emitting life signs from a little know sector of the universe. Nick Höppner's antennas happened to pick up the signals via the Legwork label, piquing his interest to find out more about where these sounds originated... Fast forward a light year, and Brother Nebula remains a mystery. What we do know though, is that after an extended mission into the further reaches of the local group, he’s returned to Earth on Touch From a Distance with four new samples ready for examination. The data - while not wholly empirical - is both atmospheric and dimensional in nature. 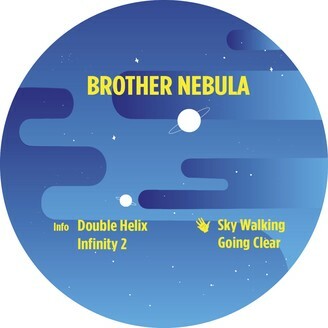 On the A side, we start off with Double Helix - a concise dissertation on the effects of extended club use on the brain, before continuing into the interstellar disco of Infinity 2. On the flip, we glide through the electronic thermosphere with Sky Walking, before expelling all thetans with the DX funk of Going Clear. TFAD is exhilarated to present the latest results of the unknown space b-boy's interstellar endeavours.